Application range:12V starter batteries.Continuous testing with battery power, won’t damage battery, including reverse polarity and over voltage protection make it ultra safe. Test and analyze battery load system, with digital results showed including Battery Life Percentage,CCA ,Battery Voltage,Battery Resistance. Wide CCA operation range from 5 Cold cranking amps to 9995 cold cranking amps,offer more flexibility to battery choice. inlcude AGM,GEL Cell,Flood, Marine Deeep Cycle batteirs. The tester is optomized to tested various battery types and offer accurate,fast and reliable testing. You could use it to easily check the whole battery condition to avoide any troble. The 12V Car Battery Tester tells you in seconds if your battery is producing enough CCA to be reliable and analyze internal plates for conductance at the same time. According to tech support, any reading(life percentage) 30% or more below rated CCA indicate your battery is not in good condition. For example, a battery rated 800 CCA is considered bad if it is pro producing 600 CCA. 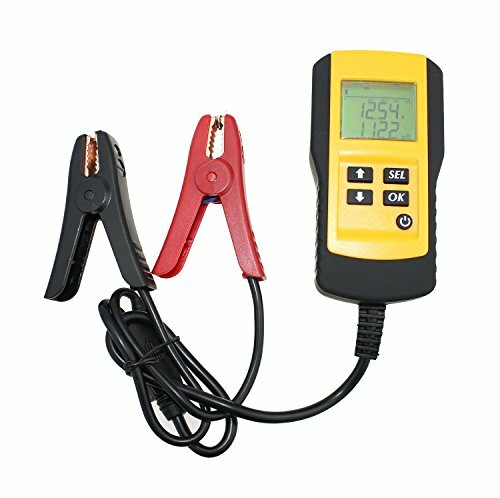 Other three features of the 12V Car Battery Tester are also great useful.The Voltage reading indicate roughly battery capacity, like 12V 80% capacity,need further charging. Knowing those shall offer you lots of information in the ability of car battery to start. 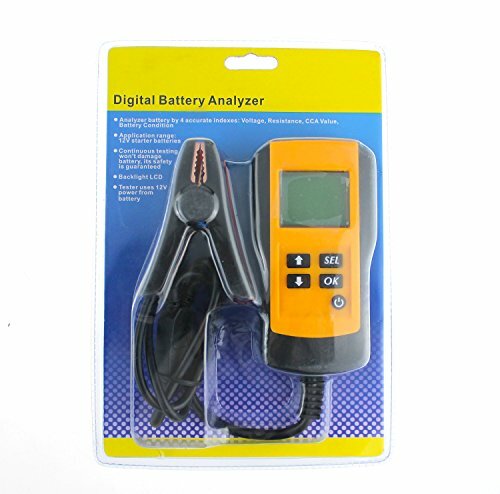 The 12V Car Battery Tester is designed to test 12V battery CCA, Voltage, Resistance, analyze battery condition and show readable testing results. 2. Press the power button for a second. The screen will light and will become active. 3. Press OK. Numbers will appear, with one flashing. 4. Press up or down buttons to input the rated Cold Cranking Amps (CCA) of your battery (found on the battery case). * To move between digits, press SEL. 5. When you have entered the CCA figure, press OK. Test Mode will appear on the screen. *If you are testing a deep cycle battery such as one in an RV or solar setup, there will be no CCA rating. They will be rated in reserve capacity or amp hours (Ah). According to some information on the internet, to get Ah multiply the reserve capacity by .6. Ultra Safe and Useful-Featured with wider range of CCA value from 5-9995 CCA,provide more option to type battery CCA value. 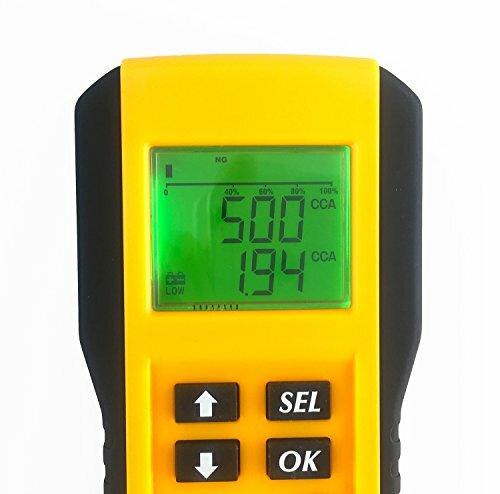 Portable design, beep remind function and LCD screen make the testing quicker and easier.